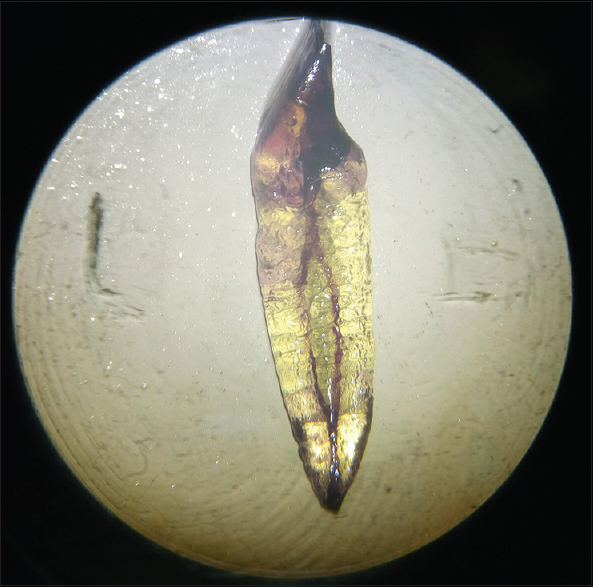 Background and Objectives: Mandibular incisor's anatomy presents a challenge when making endodontic access because of its small size and high prevalence of two canals and isthmus within them. The main objective of this study is to evaluate the root canal anatomy and its aberrant morphology in mandibular central incisors. Knowing the variations in canal anatomy such as two canals, presence of isthmus, type, its prevalence, and position in the mandibular central incisors, which help improve the procedure of successful root canal treatment. Materials and Methods: One hundred and twenty extracted human mandibular central incisor teeth were collected. Two different studies have been performed. Sixty teeth were studied through tooth clearing and dye penetration technique. Teeth were decalcified with 5% nitric acid, dehydrated with increasing concentrations of alcohol and rendered clear by immersion in methyl salicylate. Hematoxylin dye was inserted in access cavity and canals. The samples were observed under dental operating microscope. These samples were evaluated for root canal morphology to assess its root canal configuration. Sixty teeth were studied through sectioning of apical 3 mm (1, 2, and 3 mm from the apex) simulating a surgical resection method was followed. 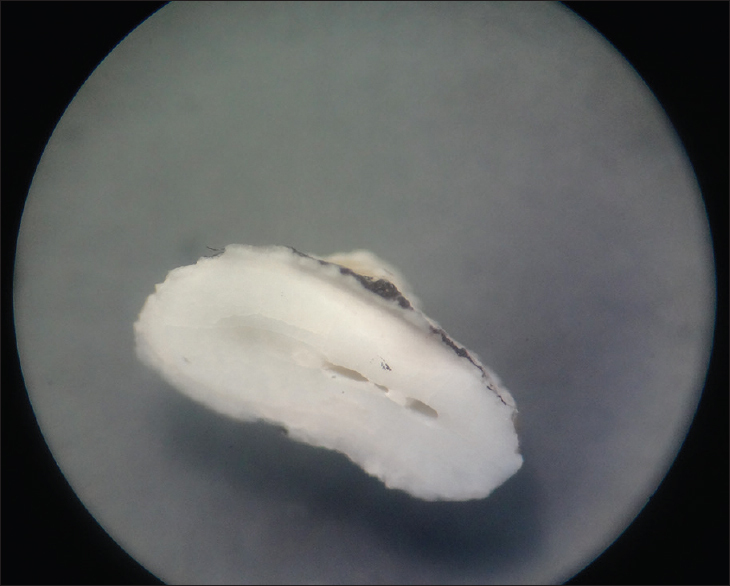 The sectioned samples were observed under stereomicroscope for evaluating isthmus and its type. 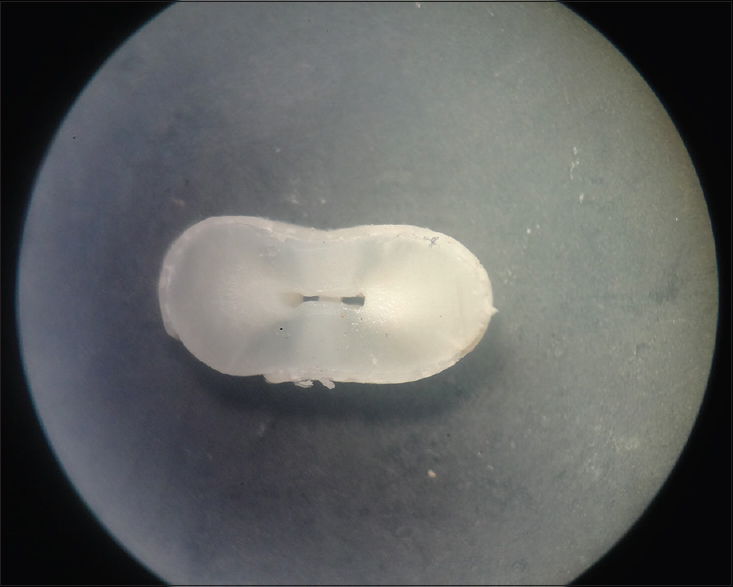 Results and Conclusion: Sectioning study showed that canal shapes varied from round to oval, long oval, and ribbon shaped, while the prevalence of isthmus was more at 3 mm section. Tooth clearing study showed that 46.6% teeth had single canal, 49.8% teeth had two canals, and only 5% teeth had two separate apical foramina. The ultimate objective of an endodontic therapy must be thorough mechanical and chemical cleansing of the entire pulp cavity and its complete obturation with an inert filling material. The root canal anatomy of each tooth has certain commonly occurring characteristics as well as numerous atypical ones, understanding of which can be the road maps to successful endodontics. The expected root canal anatomy dictates the location of the initial entry of access, it dictates the size of the first files used, and it contributes to a rational approach to solving the problems that arise during therapy. Therefore, a thorough knowledge of the root canal anatomy from access to obturation is essential to give the highest possible chance for success. Most of the problems encountered during and after root canal treatment occur because of inadequate understanding of the pulp space anatomy and its complexities. A canal is often left untreated because the dentist fails to recognize its presence. This applies to mandibular incisor teeth as well, as many dentists fail to recognize the presence of a second root canal. The most supreme reason for endodontic failure of mandibular central incisors is the presence of an undetected lingual canal or the presence of a untreated isthmus. The prevalence of two canals in mandibular incisors has been reported to be from 11.5% to 44.1% although many merge into one canal in the apical 1–3 mm of the root.,,, The incidence of two canals at the tooth's apex is reported to be as low as 1% and as high as 43%. Bifurcation of the root canal in mandibular incisors may result in complications or in operative failure during endodontic therapy. Authors studying roots with two canals commonly report an isthmus, fin, or corridor, which may be present between the two canals. Author Green has previously described this corridor as a “ribbon-shaped passage.” He had found that this ribbon-shaped passage is present in 22% of mandibular central and lateral incisors. An isthmus is a thin narrow ribbon-shaped communications between two root canals that contain pulpal tissue. It is also known as corridor (by Green), a lateral interconnection or a transverse anastomoses (by Vertucci). Isthmus, fins, web, anastomoses, lateral canals, and other irregularities within the root canal often harbors tissue, microbes, and debris following instrumentation. The endodontic morphology of mandibular incisors has been studied by many investigators. Methods of study have included replication techniques, ground sections, and tooth clearing techniques as well as radiography. There appears to be a great disparity between different studies in the number of canals, canal exits, and variations in anatomy. These differences may be due to dissimilarities in examination methods. Many studies have reported that root canal anatomy varies according to the race. Description of various studies occurring on root canal systems of permanent teeth is based largely on studies in European, North American population, and relate to mainly Caucasoid origin. Very few studies are based on Indian populations (e.g., Uma et al., Boruah et al., Thota et al.). Hence, these descriptions may not be fully applicable to the anatomical features of mandibular central incisors of Indian population. 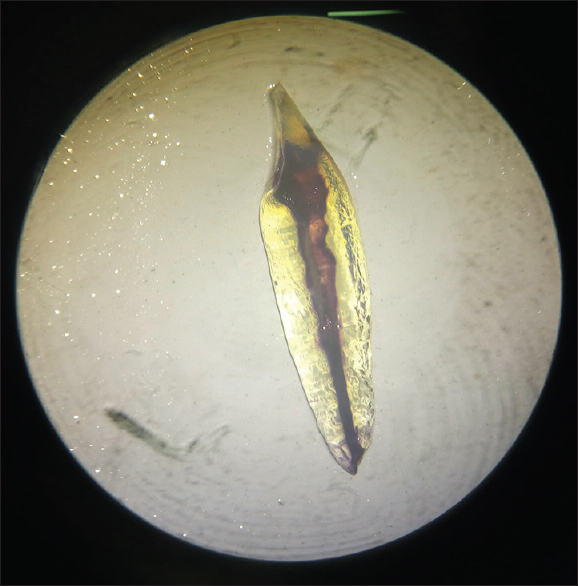 The present study is a simple combination method of tooth clearing method and sectioning of the apical portion of the root into small sections, visualizing them in the stereomicroscope. The aim of this present study is to evaluate the root canal anatomy, presence of two canals, and the presence of isthmus, its type, and position in mandibular central incisors encountered during routine root canal treatment. A total of 120 noncarious human mandibular central incisor teeth with mature apices were selected from different dental clinics and dental hospitals of North India. Collected teeth were washed under running tap water, all gingival remnants were removed and crowns were thoroughly cleaned. Then, they were stored in normal saline at room temperature till use. After selection of 120 mandibular central incisors, they were further divided into two halves giving 60 samples for each method, i.e., (1) tooth clearing method and (2) root sectioning method, respectively. Access cavities were prepared on the mandibular central incisors using cavity access set (Dentsply Maillefer, Switzerland). 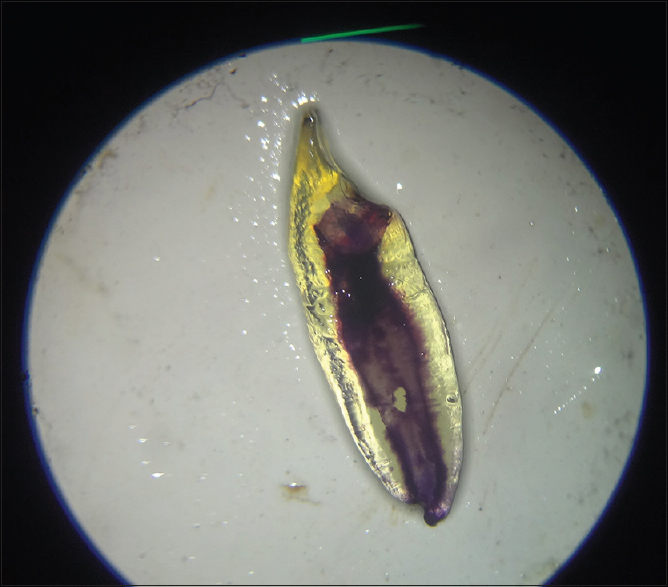 The specimens were then placed in 5% NaOCl solution for 24 h so as to dissolve organic debris and pulpal remnants. The teeth were then rinsed under running tap water for 2 h.
The specimens were decalcified for 3 days in 5% nitric acid at room temperature. The nitric acid solution was changed daily and agitated by hand three times each day. The end point of decalcification was assured by needle method, which was inserted in an unimportant part of the tooth. The decalcified samples were washed under running tap water for 4 h and then dried before sending the samples for dehydration. The dehydration process consisted of a series of ethyl alcohol rinses starting with 80% solution overnight, followed by a 90% solution for an hour, and three 100% ethyl alcohol rinses for an hour each. Finally, the dehydrated teeth were then placed in methyl salicylate which made the teeth transparent after approximately 2 h. The demineralized teeth turned transparent giving glass-like appearance. The cleared specimens were stored in the final clearing agent, i.e., methyl salicylate solution. Hematoxylin dye was injected into the pulp chamber with 27-gauge needle disposable syringe. The dye was then drawn through the canal system by applying negative pressure at the apical end of the tooth with the help of vacuum suction system. 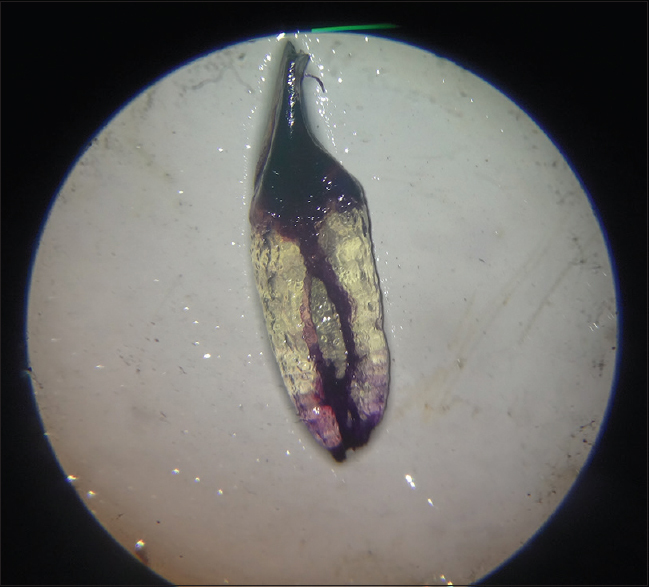 The excess dye was removed from the root surface with gauze soaked in 100% ethanol. The samples were evaluated under dental operating microscope (DOM) for better accuracy. The detailed data of mandibular central incisor anatomy and root canal configuration were observed in DOM. Sixty caries-free mandibular central incisors were randomly collected. The teeth were placed in 5% NaOCl for 15 minutes after which any remaining external tissue debris was removed by scaling. The samples were then stored in 10% formalin until use. Marking was first done on a wax sheet and it was transferred on the apical third of the root of each tooth at 1, 2, 3 mm from the apex with a pencil. 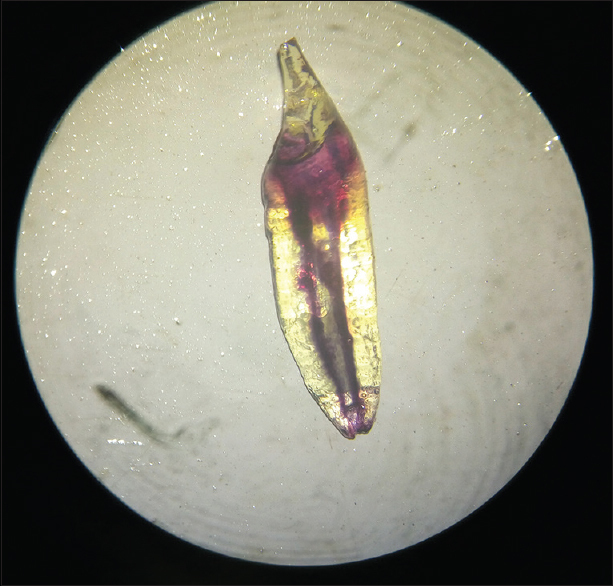 The root portion of each tooth was embedded in self-cure clear acrylic resin and cut over the pencil markings visible through the resin at 1, 2, 3 mm level from the apex with the help of a diamond disc mounted on a micro motor straight handpiece. The sectioned specimens were placed in 5.25% NaOCl for 45 min to remove organic material remaining in the canal space and stored separately in vials containing saline. 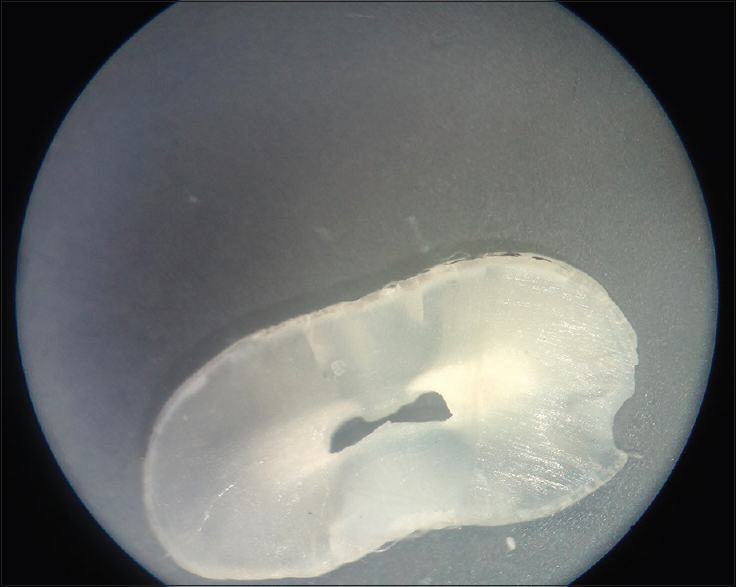 They were viewed under a stereomicroscope at ×16 magnification from the coronal aspect and evaluated for number of canals, canal shape, and presence of an isthmus. In the present study, canal morphology was determined on the basis of Vertucci's classification. The type of isthmus determined was based on Yeung Yi Hsu-Kim classification. In the present study of tooth clearing method and dye penetration, of sixty teeth, highest number of specimen showed Type I canal configuration [Figure 1], while Type II, Type III, Type IV, and Type VI configurations of the canal according to Vertucci classification was also observed [Figure 2], [Figure 3], [Figure 4], [Figure 5] and [Table 1]. Other than Vertucci classification, different canal configuration was observed in two specimens - (1-2-1-2-1) configuration in which two canals leave the pulp chamber interconnects in the root and then redivide as two canals, which again joins short of the apex giving single apical exit and (3-2) configuration where three different canals leave the pulp chamber, of which two canals merge in the root and continue as a single canal along with the other canal, giving two canals at the apex ending at two different apical foramen [Figure 6] and [Figure 7]. 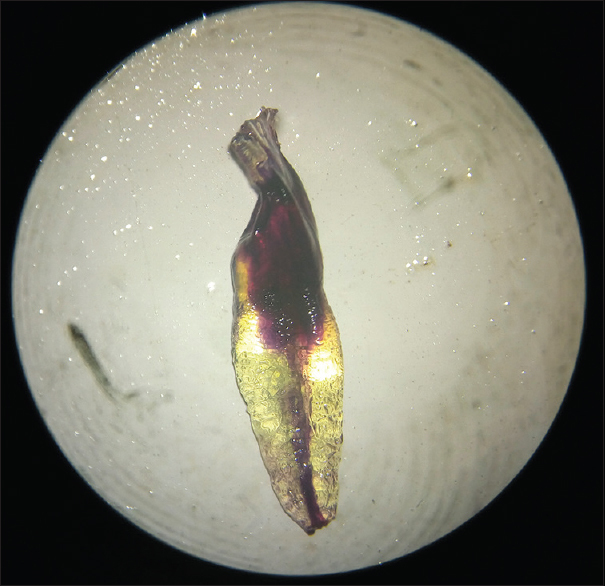 Of sixty sectioned specimens at 1 mm, 2 mm, and 3 mm from the apex, observed under stereomicroscope, majority of the sectioned specimen showed single canal, while two canals were also observed in few specimens. A triple canal was also observed at 2 mm from the apex [Table 2]. On observing the sectioned specimens, the shape of the canal in mandibular central incisors showed variation in shape in relation to the distance from the apex [Table 3]. Mandibular central incisors showed variation in shape of canal as moving away from the apex. Probability of having long oval and ribbon shaped canals increased in sectioned specimens at 2 mm and 3 mm from the apex. Mandibular central incisors exhibit round and oval shape canals at 1 mm from the apex [Table 3]. In the present study, root sections of all the sixty mandibular central incisors were also studied for the prevalence of isthmus at various distance from the apex and its type according to Hsu and Kim classification [Figure 8], [Figure 9], [Figure 10], [Figure 11], [Figure 12]. On observing all the sections, highest prevalence of isthmus was 36.6% at 3 mm distance from the apex. There are 13.33% chances of presence of isthmus at 2 m from the apex and 6.6% chances of the presence of isthmus at 1 mm distance from the apex [Table 4]. The study of the complex root canal morphology is very important and various techniques have been advocated. The methods most commonly used in analyzing the root canal morphology are plastic resin injection, canal staining and tooth clearing,,, and conventional radiographs., Retrospective observation of endodontically treated teeth by using two-dimensional periapical radiographs was found to be the most common technique, digital and contrast medium-enhanced radiographic technique, radiographic assessment enhanced with contrast media, and more recently computed tomographic techniques are used. Vertical sectioning and longitudinal sectioning can be done, but this does not allow a continuous view of the entire root canal system. Longitudinal sectioning compensates for it, but a 3D picture is not possible. Cross sections of teeth give a 3D view of pulpal spaces within the tooth, but the morphology of the exterior of tooth was destroyed in the process. Hence, this technique was used in this study. Although various classification and configuration are given by different authors, the most accepted classification is Vertucci's classification. Vertucci  reported that of 100 mandibular incisors, highest 70 teeth showed single canal Type I configuration. Twenty-two teeth showed Type III configuration (1-2-1). Five teeth showed Type II configuration (2-1) and three teeth showed Type IV configuration (2). Walker (1987) reported that of 200 mandibular incisors extracted from 151 Chinese patients, 73% had one main root canal. 22% of the mandibular central incisors had two separate canals. Only one central incisor showed two separate canals existing through separate apical foramen. This result does not corelate with the results obtained in the present study may be because of the difference in technique used to observe, difference in ethnics, and also in the diversities of both the races. Sert et al. studied 200 mandibular central incisors in Turkish population and reported that Type I canal - 65 teeth, Type 2 (2-1) canal - 55 teeth, Type 3 (1-2-1) canal - 54 teeth, Type 4 (2) canal - 20 teeth, Type 5 (1-2) canal - 1 teeth, Type 8 (3) canal - 4 teeth, and 1 tooth showed 1-2-3-2 configuration. In a study of Jordanian population, it was found that 73.8% of the mandibular incisors possessed a single root canal and 26.2% of teeth had two canals. The literature reveals that 11%–68% of mandibular incisors possess two root canals although many merge into one canal in the apical 1–3 mm of the root. Al-Fouzan et al. reported that 70% of mandibular central and lateral incisors was classified as Type I. Thirty percent of mandibular central and lateral incisors was classified as Type III, all the examined specimens had only one main apical foramen. Boruah et al. observed root canal morphology of mandibular central incisors in North East Indian population. He reported that 36.25% of mandibular incisors in this North East Indian population had two root canals. In the teeth with two canals, the Type III canal configuration was the most prevalent followed by Type II. The pulp space anatomy of mandibular incisors in North Indian population showed a high complexity, including variations in root canal configuration, number of canals, and presence of isthmuses. 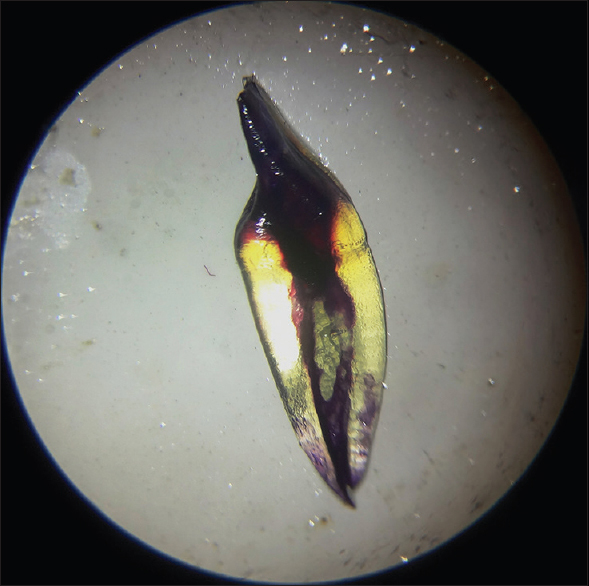 DOM which was introduced into endodontics to provide enhanced lighting and visibility, has proved to be one of the important aids for locating root canals. It could bring minute details into clear view and enhance the ability of the clinician to selectively remove dentin with great precision thereby minimizing procedural errors. An isthmus can be defined as an intercanal connection or transverse anastomosis or a corridor between two root canals encompassing dental pulp and pulp-related tissue. An isthmus can be observed between any two root canals within the same root. As the isthmus houses the dental pulp, it might serve as a potential site for bacterial growth and thus, making complete debridement of this area indispensable. Whenever two or more root canals are present, an isthmus should be suspected and all attempts should be made in detecting and debriding it. The embryonic origin of the isthmus in the root canal system is through Hertwig epithelial root sheath. In single roots, gaps occur in dentin formation that in turn prevents cementum deposition in these areas. This leads to the formation of lateral and accessory canals most commonly observed in the apical third of the root. In the present study, the type of isthmus was determined based on Yeung Yi Hsu and Kim classification. 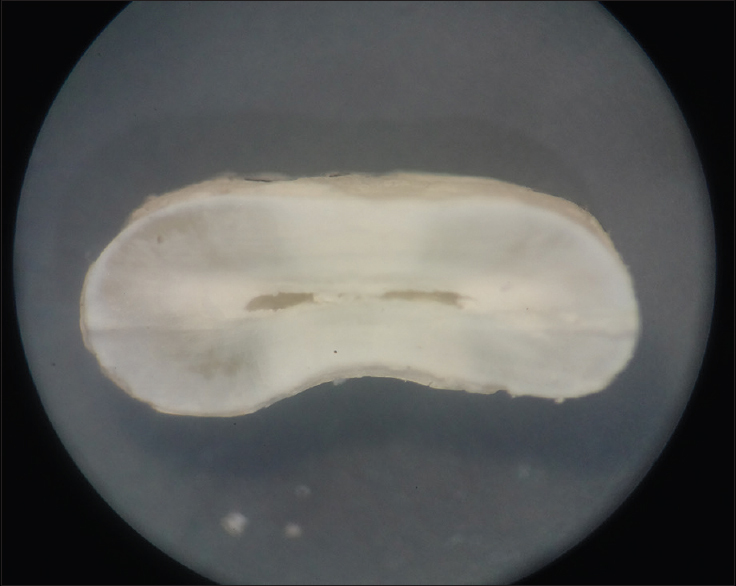 In this study, the method used to evaluate the isthmus was by sectioning the apical 3 mm of the root of mandibular central incisors into 1 mm sections and then visualizing the sectioned specimen into stereomicroscope. Mauger et al. demonstrates that, at the apical 1, 2, and 3 mm levels in the root, the canal is rarely separated by hard tooth structure and that an isthmus of tissue is frequently present. Thus, standard instrumentation techniques may not adequately prepare the canals with various isthmus and lateral canals. Uma et al. 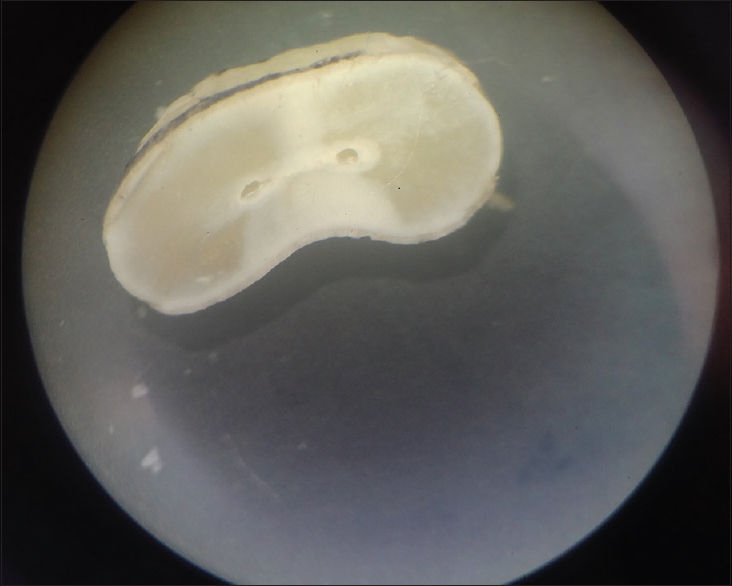 observed that on examination of sectioned specimens, 49 of 50 teeth examined had one single canal and only one had double canals at 1 mm level. They found that there were more amount of ribbon-shaped canals and long oval canals at 3 mm sections of the tooth, while at 1 mm sections and 2 mm sections more amount of oval and round canals were observed. This can be easily related to the results observed in our study. In the recent era, the use of clinical microscope for root canal treatment allows a higher detection of extra root canals and also enables proper visualization and cleaning of the isthmus, thereafter increasing the quality and success rates of the endodontic treatment. Moreover, digital radiography, including advanced imaging techniques such as computed tomography (CT), micro-CT, and cone beam volumetric imaging, provides 3D information for either research or routine endodontic and surgical treatment planning without damaging the sample. Within the limitations of this study, it can be concluded that only 3.33% showed two separate apical foramina, while other than Vertucci's classification, two distinct and varied configuration was observed in the present study (3-2), (1-2-1-2-1), respectively. In the root sectioning method, the highest prevalence of isthmus was observed at 3 mm distance from the apex 36.6%. Mandibular central incisors showed variation in shape of canal as moving away from the apex. Probability of having long oval and ribbon-shaped canals increased in sectioned specimens at 3 mm from the apex. Majority of the mandibular central incisors exhibits round and oval shape canals at 1 mm from the apex. Hence, from the present study, it can be concluded that the pulp space anatomy of mandibular central incisors in North Indian population showed a high complexity, including variations in root canal configuration, number of canals, shape of canals, and presence of isthmuses. Bringing it all together, a successful treatment is more expected when the experienced clinician has not only adequate armamentarium and technology but also a comprehensive knowledge of the root canal anatomy of the tooth. Boruah LC, Pertin P, Bhuyan AC, Kalita C. Root canal morphology of permanent mandibular incisors in a Northeast Indian population –In vitro study using a root canal staining technique. ENDO (Lond Engl) 2010;4:273-7. Uma CH, Ramachandran S, Indira R, Shankar P. Canal and isthmus morphology in mandibular incisors – Anin vitro study. Endodontology 2004;16:7-11. Mauger MJ, Schindler WG, Walker WA 3rd. An evaluation of canal morphology at different levels of root resection in mandibular incisors. J Endod 1998;24:607-9. Madeira MC, Hetem S. Incidence of bifurcations in mandibular incisors. Oral Surg Oral Med Oral Pathol 1973;36:589-91. Kartal N, Yanikoglu FC. Root canal morphology of mandibular incisors. J Endod 1992;18:562-4. Thota LB, Gunaranjan T, Krishna VN, Sridhar M, Reddy AE. Root canal morphology of mandibular central incisors in Nellore population. IJOCR 2016;4:8-10. Hess W, Zurcher E. The Anatomy of Root Canals of the Teeth of the Permanent and Deciduous Dentition. New York: William Wood & Co.; 1925. Alavi AM, Opasanon A, Ng YL, Gulabivala K. Root and canal morphology of Thai maxillary molars. Int Endod J 2002;35:478-85. Klein RM, Blake SA, Nattress BR, Hirschmann PN. Evaluation of X-ray beam angulation for successful twin canal identification in mandibular incisors. Int Endod J 1997;30:58-63. Plotino G, Grande NM, Pecci R, Bedini R, Pameijer CH, Somma F. Three-dimensional imaging using microcomputed tomography for studying tooth macromorphology. J Am Dent Assoc 2006;137:1555-61. Weine FS. Case report: Three canals in the mesial root of a mandibular first molar? J Endod 1982;8:517-20. Verma M. Clearing technique and its potential application, an in vitro study. JIDA 2011;5:1112-23. Al-Fouzan KS, Al-Manee A, Jan J, Al-Rejaie M. Incidence of two canals in extracted mandibular incisors teeth of Saudi Arabian samples. Saudi Endod J 2012;2:65-9. Germain L. Isthmus gifts. Dent Today 2013;32:82-5. Lima FJ, Montagner F, Jacinto RC, Ambrosano GM, Gomes BP. Anin vitro assessment of type, position and incidence of isthmus in human permanent molars. J Appl Oral Sci 2014;22:274-81. Hess W. Formation of the root canals in human teeth. J Natl Dent Assoc 1921;3:704-25.